How important is a Kitchen Herb Garden in today’s world when we have slipped into an existence of ease and comfort with utter disregard for holistic health? Only as important as clean air, unpolluted water and unadulterated food. It is with this aim that we are promoting or rather trying to bring back the concept of an Ayurvedic herbs garden, along the principles of Vrikshayurveda. The concept of a patch of medicinal plants at home is no novelty to our culture. We have traditionally always had a bunch of medicinal herbs and plants growing around our homes, sometimes even growing wild. We learnt to identify them at an early age and knew what leaves to pluck and what roots to dig up in the case of an insect bite or upset stomach. However, all that precious wisdom and oral traditions that have been passed down through the ages have slowly disappeared to give way for modern unhealthy practices like popping toxic chemicals into our bodies. The need of the hour now is to revive this knowledge and promote home remedies that are harmless yet effective and incorporate simpler solutions for everyday ailments. And the first step towards this is a kitchen Ayurvedic herbs garden. If you think about it, nothing could be simpler. Let us start with a list of plants you will need. 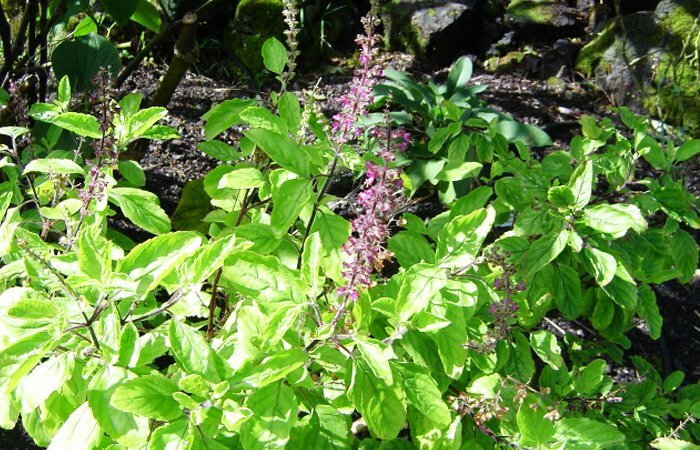 Thirteen essential plants for an ayurvedic herbs garden. While most of these are still available around us, a few of them seem to have disappeared from our yards and can only be found in specialized nurseries selling medicinal plants. We need to bring them all back into regular circulation. And all you need is a patch of earth to do this. And those who live in high-rises where a handful of earth is a luxury, they can always resort to terrace/balcony gardening and grow them in containers. Most of these are hardy plants that do not require high maintenance. Being native plants, they are also tolerant of local climatic and soil conditions. To make things easier for you, we are coming up with a list of places were you can obtain seeds/saplings of these medicinal plants and herbs and also a series featuring each of these plants.